ENDLESS POSSIBILITIES! 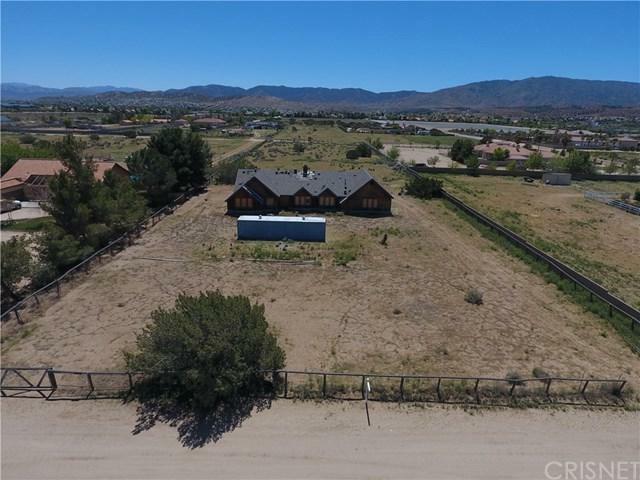 Amazing Single Story CUSTOM Home with great views ready for you to FINISH IT YOUR WAY on a 2.58 acre lot close to a park. SAVE months of time since you continue where sellers left off. Approved plans just need to be updated with building and safety! 1200 gallon septic tank already installed, along with slab, 2+G-x 6+G- framing on outside walls and rough plumbing. Some sections of tile roof need to be repaired. ALL UTILITIES are at the property including water, power, natural gas, phone, and cable. One bedroom that could be for mother-in-law or teenager. One other bathroom and two other bedrooms and master suite are on the opposite side with the master having a SPA INSIDE THE BEDROOM. CATHEDRAL ceilings in living areas and master. 1000 sq. ft OVERSIZED 3 car garage allowing a large work area and storage and you can move conex to back of property for extra storage or build additional buildings. Yes, HORSES are allowed as well as other animals as zoning allows for light agriculture. Can build an ADDITIONAL HOME not more than 1200 sq feet on the back of the lot. Plans call for a covered patio in the back allowing for a great mountain view. This area surrounded by other high end custom homes is in the unincorporated area of LA County. Buyer and buyer's agent to verify all information provided herein by listing agent. Lenders indicate getting a Construction-to-perm loan for buyers not having all cash. It is possible that you can be the ONE ENJOYING LIVING HERE!